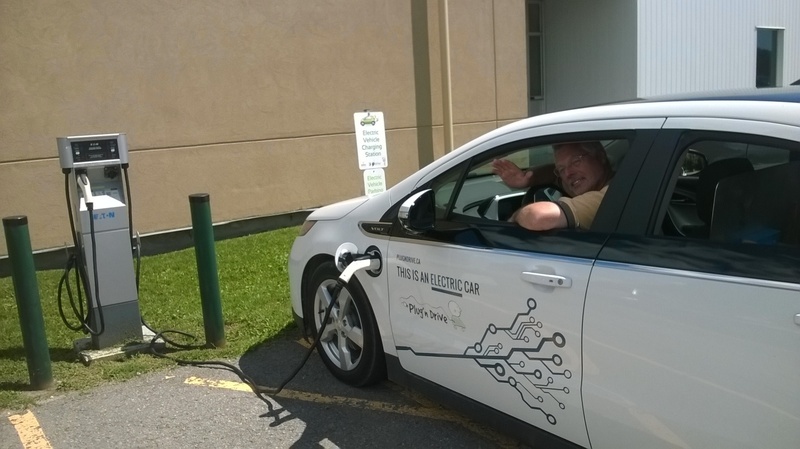 Ron Groves of Plug’n Drive gets a battery charge for his Chevrolet Volt from the electric vehicle (EV) charging station at St. Lawrence College. The SEARC Open Solar Outdoor Test Field (OSOTF) provides solar derived electricity to partially power these EV chargers. Plug’n Drive is a not for profit, electric vehicle advocacy group. They were here in Kingston for this past weekend’s Princess Promenade alongside the Sustainable Kingston organization. Plug’n Drive provided a number of electric vehicles for Kingstonians to test drive and to learn more about the benefits of electric vehicles. The Renewable Energy Generator and Storage (REGES) trailer belonging to the ESET program at St. Lawrence College was also operational. It provided solar derived electricity to the chargers used to charge the demonstrator electric cars.